Congratulations to Ronan Fernandez for his new paper! Use of a fluoride channel as a new selection marker for fission yeast plasmids and application to fast genome editing with CRISPR/Cas9. Fission yeast is a powerful model organism that has provided insights into important cellular processes thanks to the ease of its genome editing by homologous recombination. However, creation of strains with a large number of targeted mutations or containing plasmids has been challenging because only a very small number of selection markers is available in Schizosaccharomyces pombe. 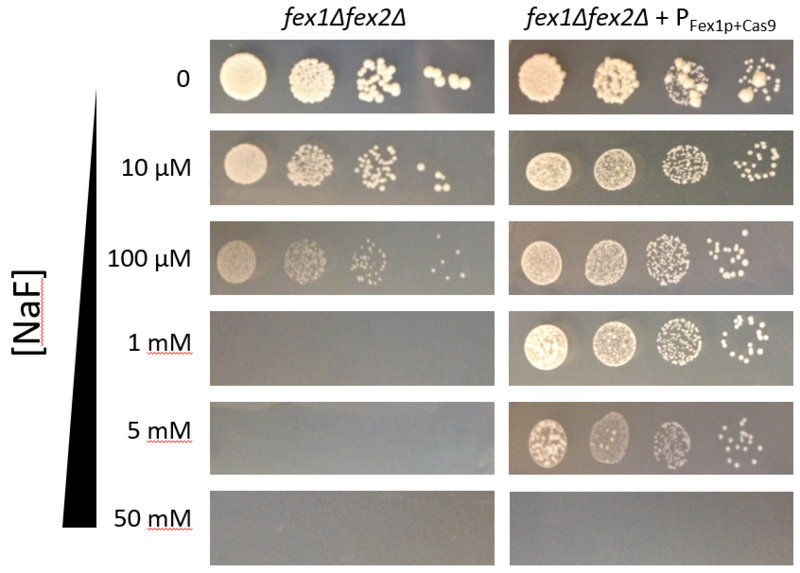 In this paper, we identify two fission yeast fluoride exporter channels (Fex1p and Fex2p) and describe the development of a new strategy using Fex1p as a selection marker for transformants in rich media supplemented with fluoride. To our knowledge this is the first positive selection marker identified in S. pombe that does not use auxotrophy or drug resistance and that can be used for plasmids transformation or genomic integration in rich media. We illustrate the application of our new marker by significantly accelerating the protocol for genome edition using CRISPR/Cas9 in S. pombe. This entry was posted in Publications on December 8, 2016 by jb246. A new release of the PatchTrackingTools is now available! This entry was posted in Uncategorized on December 10, 2015 by jb246. Berro J and Pollard TD. Local and global analysis of endocytic patch dynamics in fission yeast. 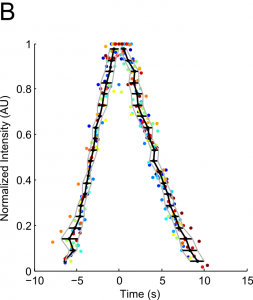 The first paper presents new methods to collect and analyze quantitative microscopy data. We describe a new “temporal super-resolution” method to realign datasets obtained with low temporal resolution and reconstruct a signal with higher temporal resolution. 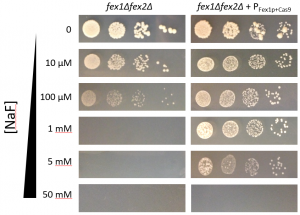 This method allowed us to demonstrate the high reproducibility of endocytic events in fission yeast, and to show that endocytic vesicles move with a diffusive motion that is modulated by actin disassembly. 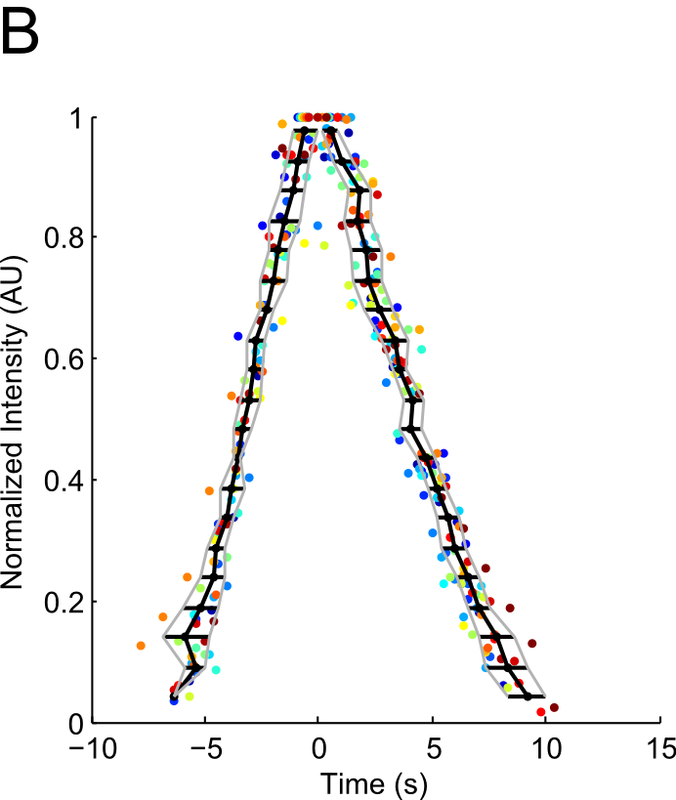 In this paper, we also present a new method to automatically estimate the number of endocytic events in a cell at a given time point. 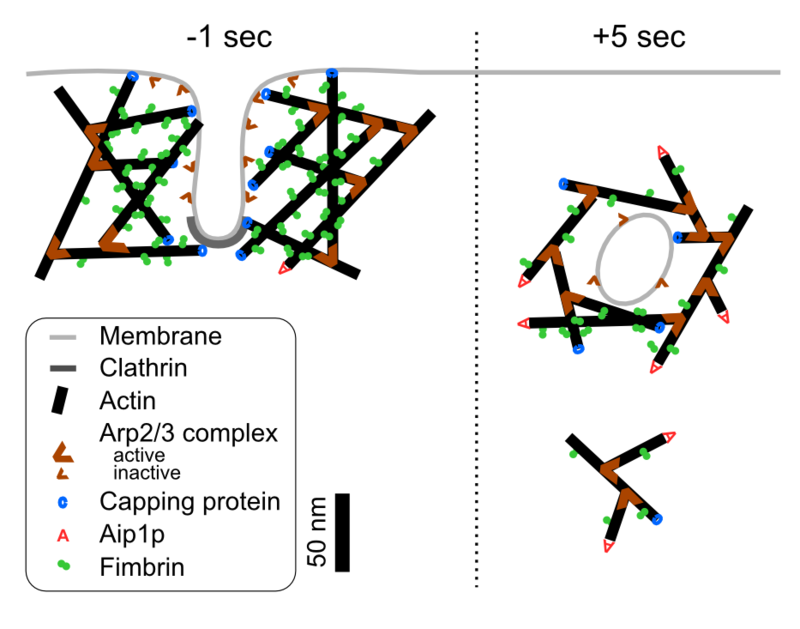 Application of these new methods allowed us to demonstrate in a second paper that Aip1p caps the barbed ends of actin filaments in a specific context and can be replaced by the canonical capping protein heterodimer Acp1p/Acp2p. 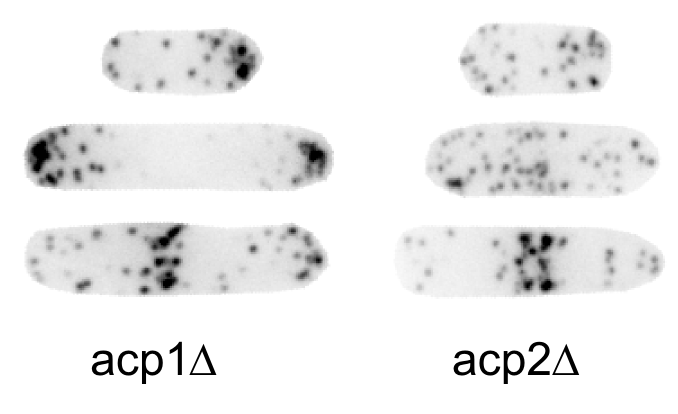 However, Aip1p cannot replace Acp1p/Acp2p. 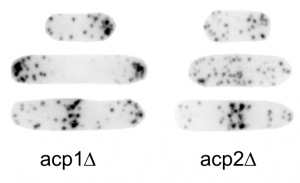 Our data also point out new independent functions for Acp1p and Acp2p in cell polarity. Finally, our quantitative analysis allowed us to infer geometric properties of the endocytic structures and to show that the actin meshwork compresses before scission of the endocytic vesicle. This entry was posted in Uncategorized on November 22, 2014 by jb246. 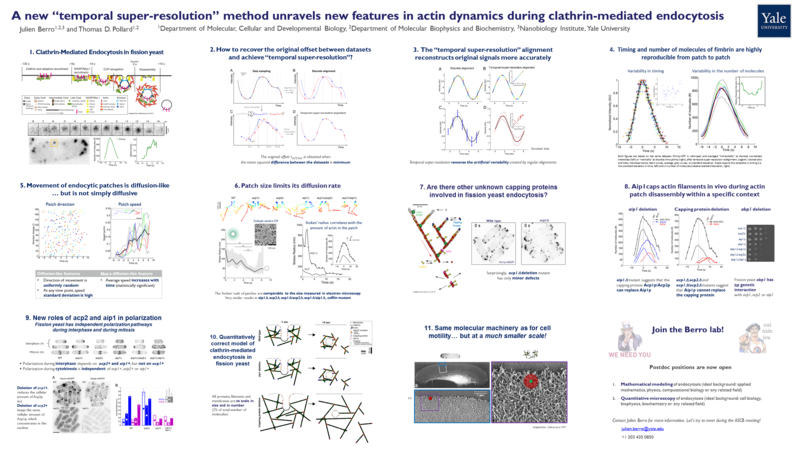 … on cytokinetic node assembly, led by Matt Akamatsu. This entry was posted in Publications on April 5, 2014 by jb246. This entry was posted in Meeting on December 23, 2013 by jb246. Welcome to the Berro lab! The Berro lab develops experimental and quantitative methods for cell biology, biochemistry and biophysics to understand the molecular mechanisms of fundamental cellular processes. Our research is currently focused on unraveling how the molecular machinery of clathrin-mediated endocytosis generates forces to deform the plasma membrane and conversely how this machinery senses membrane tension and adapts to it. This entry was posted in Research on December 8, 2013 by jb246. Julien Berro will be at the ASCB meeting in New Orleans, December 14 – 18, 2013. Come to his ePoster talk on Sunday and his poster on Tuesday. This entry was posted in Meeting on December 8, 2013 by jb246.